This April will be the ten-year anniversary of my love affair with music. When I was 14 my parents finally succumbed to years of begging and bought me an off-brand acoustic guitar. I, being 14, played the hell out of that guitar--hours upon hours a day of painful fretting. At sixteen my parents (seriously, they're really cool) bought me a brand new Gibson SG Standard. Again, hours and hours of play. Mostly classic rock--Bowie, Zeppelin, Pink Floyd, the Allman Brothers, Bad Company, The Beatles, Neil Young, Rush--with some ska and punk thrown in. I formed a band with some guys. We sucked, but we had a lot of fun. Then I went to college, made friends who were (coincidentally) all musicians. We'd sit around at night and pass a guitar and sing and act like idiots. Some of us formed another band. We sucked a little less. Then I formed another band, this time a folk act with a girl who had amazing talent. We were halfway decent. Then I moved to San Francisco. Now I live in a tiny apartment and--I'm sure--annoy my neighbors. What I'm trying to convey is that I've played guitar for a long time, in a lot of different capacities. I say this because I am literally incapable of judging Rocksmith as a learning tool. I'm going to try and discuss it as a learning tool at points, but by and large the features that appeal to me about Rocksmith are very different than the features that would appeal to someone who just bought his or her first guitar. Rocksmith 2014, if you missed the first one, is basically more-than-education-software-less-than-a-game. Remember how people used to make fun of Guitar Hero players and say "Just go learn a real guitar"? Rocksmith is that game. Once the funeral pyre of the plastic instrument craze burned away, Rocksmith's red coals shone through. Let me repeat: Rocksmith is less than a game. This isn't something you bust out at parties like Rock Band and everyone just picks up an instrument and has a great time. This is a real tool to help you either learn or practice guitar, and practicing an instrument is hard work. To make it easier, Rocksmith 2014 features 55 genre-spanning songs for you to learn and practice (as well as the option to import songs from the first game for a small fee, and the inclusion of future and past downloadable content). Iron Maiden, Boston, The Ramones, Weezer, The Dear Hunter, The Shins, Queen, Radiohead--the game's track listing is rock-focused, as you'd expect from the name, but there's a pretty good variety here. Learning the songs is where Rocksmith 2014, like its predecessor, starts to break down for me. Now, again, I'm coming from a guitar background. If you play guitar, there's a good chance you've learned songs using guitar tablature. Rocksmith eschews standard tablature for a format that greatly resembles Guitar Hero/Rock Band's "note highway"--long streams of notes that move towards the screen. Here's the catch: if you're using Rocksmith to learn guitar, as in you've never played before, you're probably going to have no trouble picking up the note highway format. Me? I still find it annoying. Sure, the developers made some improvements to the new version, like making sure the initial note of each riff is marked with a number. You can also jump the difficulty to maximum immediately instead of waiting and leveling up the difficulty of each song individually. But when I pumped the difficulty up to a point where I'd play the actual song, all the way through, the note highway became overwhelming. This is where my guitar experience comes into play. I've read tabs for ten years, and I've reached a point where I can sight-read them in time with most songs. Rocksmith's note highway, for someone used to tablature, is cumbersome. I tried learning Heart-Shaped Box by Nirvana. It's not a very hard song--Kurt Cobain was a great musician, but his guitar parts were pretty simple by design. I thought it would be a great place to start with Rocksmith. Visual chaos. Even a song as straightforward as Heart-Shaped Box felt insurmountable. Then, for comparison, I booted up the tab on Ultimate Guitar and played it easily, first time through. So my problem with Rocksmith isn't that it is a bad way to learn. If you're just starting out with guitar, learning songs in Rocksmith is much more intuitive than learning tablature, and the new missions (which prompt you to "Learn a song in E flat tuning" or "Learn a song from the '60s") guide you through the song catalog better than the last game's repetitive career mode. My main issue is that--as an established guitarist--the note highway is more trouble than it's really worth. You'll probably learn quicker by snagging tablature off the Internet. I sunk hours into Rocksmith 2014, though. I'd look at the clock and realize it was four in the morning, and I'd been playing for five hours already. The key feature in Rocksmith 2014--the reason I'd urge every guitarist to buy a copy--is Session Mode. I wrote about Session Mode back at E3, after only gotten a brief hands-on session. At the time I felt pretty certain Session Mode was the thing that would sell me on a new Rocksmith game. Session Mode is like a band and a backing track rolled into one. When you enter Session Mode you select which instruments you want in your band--maybe a wailing organ, a funky guitar, and a vintage drum kit. Start playing your guitar and the AI dynamically generates a bed of music for you to play over, reacting to how you're playing. Play loud and intense, your "band" plays loud and intense. Play soft, and they'll settle down. Stop playing and the band trails off expectantly, waiting for you to kick back in. It's more complex than that, of course. The band will even lead you into chorus-type sections, or speed up to match your pace. You can also change a whole array of variables whenever you want--key, mode, groove, tempo. I've had a lot of fun playing solo blues guitar over an old-timey blues shuffle band with the group dutifully following a 12-bar setup, but you can get really wild. Wonder what it's like to play guitar in a progressive funk band in Mixolydian B-flat? Well, you can have that (insane) experience. Session Mode shows you which notes are in-key, so you'll even sound halfway decent playing in a key and mode you've never touched before. If you've ever wanted to play in a band but were too nervous, or if you live in a place (like San Francisco) that's not conducive to practicing as often as you'd like, Session Mode is maybe the coolest thing that's ever been in a music game. There's still some features I'd like to see--currently you can't change time signature--but it's an impressive piece of tech, and I've sunk hours into it. It's made me better at scales, better at reacting to key changes, and an all-around better improviser. You're not really making music you'd want to record, but it's a new way to practice skills that are typically hard to master. One big relief: you don't have to tune before every song anymore. The original Rocksmith, it felt like you had to tune your guitar every two or three minutes. Now you're prompted to tune on start-up, but the game won't ask you again unless you play a song with a non-standard tuning. You can access the tuner whenever you want, however, as well as the Riff Repeater--a practice tool where you repeat the same section of a song with increased difficulty each time you get it right--by hitting the space bar during a track. Tone Designer brings back the amp simulator built into the original Rocksmith, this time with licensed gear from Marshall and Orange. If you can't afford a $1,000 Orange head and cab combo, Rocksmith at least lets you pretend you can. 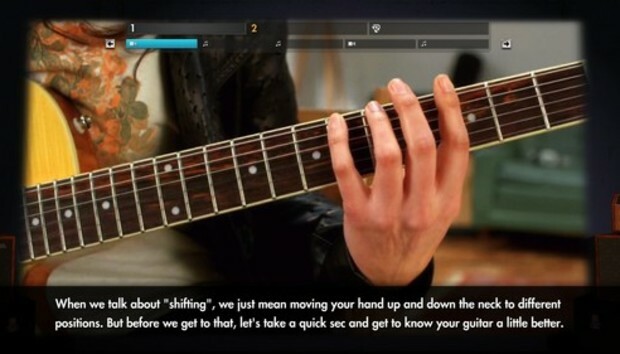 The game is loaded with videos to teach you core guitar concepts, from "How to attach a guitar strap" to techniques like barre chords and string-skipping. The videos are a bit dry, but unlike the first game you can always skip the lesson and go straight to the practice track if you'd like. And there are still a variety of mini-games in Guitarcade mode to make skill practice a bit more fun. The games are modeled after old arcade cabinets, complete with a throwback loading screen and arcade-y guitar tones. My favorite was probably Return to Castle Chordead, a House of the Dead, lightgun-style parody where you play chords to shoot enemies. These seem like they'd be great learning tools for dry topics (like scales) that used to require drills or rank memorization. I highly recommend Rocksmith 2014 on the strength of Session Mode alone. It's the best approximation I've ever seen for playing with a real band, and you don't have to find a band and schedule time together when you just want to jam for fifteen or twenty minutes. As for the rest, Rocksmith 2014 is a much-needed incremental update for the original game. I still find the note highway an inefficient way for me to learn guitar, but I can recognize its usefulness to beginners, and most of my other complaints from the original game are solved here--I only need to tune once instead of every song, for example, and Guitarcade games have much better production value. The game has a solid set of tracks to dip into, and Ubisoft is promising weekly downloadable songs this time around. Overall, this game is a great effort from Ubisoft San Francisco and a practice tool I anticipate returning to for the foreseeable future. Mastering an instrument's never going to be easy, but Rocksmith at least makes the whole process approachable while still providing experienced guitarists plenty of fun tools to experiment with. A NOTE ON LAG: Rocksmith's lag is almost non-existent, provided you aren't passing your system's audio through an HDMI cable. HDMI introduces hardware lag that will greatly diminish your experience. It's not the fault of the developers; it's just how HDMI works. If possible, I recommend routing audio out through another system before playing Rocksmith.